The Pittsburgh area has become a hotbed for Maker spaces. Through Remake Learning I recently had a chance to visit the Duquesne School District where all preK-6 students have access to Making activities in two specially designed spaces as well as their classrooms. This spring you can find many different making opportunities through Remake Learning Days, May 17-25. 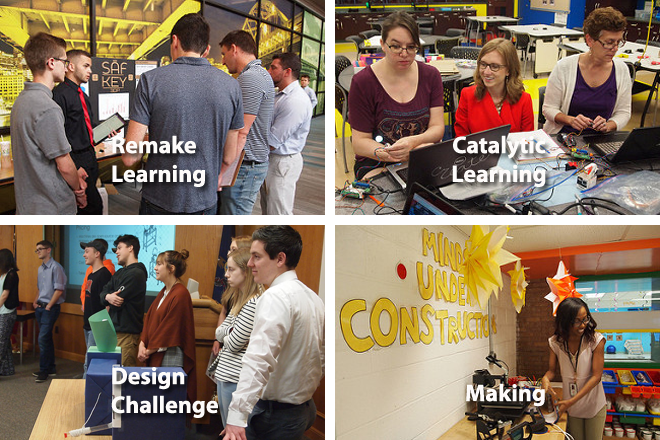 Remake Learning Days provide hands-on, technology-infused, engaging and relevant learning experiences in neighborhoods across southwest Pennsylvania and West Virginia. I continue to coordinate the programming for the Three Rivers Educational Technology Conference (TRETC). This spring we began to formulate our plans for TRETC 2018, which will be hosted by the Baldwin-Whitehall School District on November 6, where we’ll look at Technology and the Future of Work. We’re looking for proposals for poster and spotlight session presentations until August 31. I continue to work with the South Fayette School District on the STEAM Innovation Summer Institute. This year the professional development activities will occur from June 18-21 with most of the activities on the South Fayette campus, but with opportunities for Sustainabity/Project-based Learning at Chatham’s Eden Hall campus and Project-based Learning sessions at the Consortium for Public Education. This year there will be a new leadership track in addition to the classroom focused sessions that include: Robot Petting Zoo with a Hummingbird, Making, Coding and Computational Thinking, STEAM, Makey-Makey, Robot Petting Zoo, BlocksCAD, Augmented and Virtual Reality, Visible Thinking, Happy Atoms, Raspberry Pi and Python, and Student Voice through Social VR and digital story-telling. I’m working with Birdbrain Technologies to develop Catalyze Learning, an international user conference in Pittsburgh from July 23-25. Birdbrain has schools in over 40 countries currently using the Hummingbird and Finch to integrate robotics into the curriculum K-12. Birdbrain hopes to have presenters from around the globe share their ideas about using maker technology to catalyze learning. All participants will receive a new premium Hummingbird Kit that taps into the power of Micro:Bit.